The house is a family cottage, rented out for holiday lets. It is a treasured family home which we are happy to share with our many friendly guests. The house is situated in Kilpheder on the Island of South Uist. It has a large fenced garden, driveway with gate, front and side entrance doors, 2 double bedrooms and 1 twin bedroom. The modern kitchen has a variety of crockery and cooking utensils as well as a dishwasher, microwave, washing machine, fridge and freezer. There is seating for 4 at the kitchen dining table but there are extra chairs around the house for extra diners. Travel cot and high chair can be provided on request. The sitting room sits 6 comfortably on the leather couches. Digital TV is provided on a widescreen TV. There is also a DVD player available for use. All linen and towels are provided. The bathroom provides a power shower, bath and towel rail. 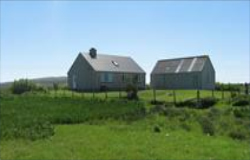 The house is set a within a large croft which has 2 very friendly pigs and some sheep. In the spring, there are always some new born lambs running around the croft. Lets are available for a minimum of 1 week, however, please get in touch if you are looking for anything else as we may be able to accommodate.